The escalating havoc and ultraviolence of Vigilance holds an effective, if culturally specific, mirror to violence and fear in the US. CONTENT WARNING: This review discusses gun violence throughout, and includes references to child death. Also, we're discussing the whole novella, so BEWARE SPOILERS. 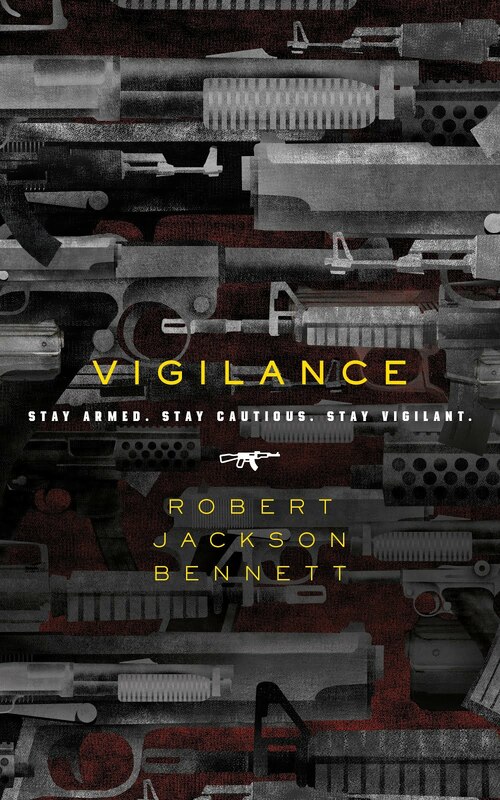 Vigilance, the new novella from Robert Jackson Bennett, is out today and it's a searing look at gun violence in the US. In this near future dystopia, John McDean is tasked with running "Vigilance", the nation's favourite reality programme, which releases real shooters are released on unsuspecting locations with military-grade armaments, and the resulting carnage is broadcast as a "lesson" in how to protect oneself. McDean and his crew at ONT station think they have the variables of Vigilance down to a fine art, but in the novella's ensuing escalation find themselves taken down by one of McDean's own blindspots, to dramatic effect. We've got a lot of Bennett fans on our team here at Nerds of a Feather and when this novella came to our attention, lots of us were interested in reading it to review. That's why, instead of taking it on alone, today I, Adri, am joined by Paul Weimer, Brian, and Joe Sherry to unpack Bennett's highly topical novella and our reactions to it. Adri: Vigilance is a novella about a near-future America that “from the beginning, … had always been a nation of fear”. In it, the perception of internal and external threats has given rise to a reality TV show (also called Vigilance), where state-sanctioned shooters are let loose in public spaces with the subsequent carnage broadcast for entertainment and “education”. Was Vigilance what you expected going in? When I picked up the novella, which was before these tweets, I went in with the expectation that it was aimed at gun violence and gun culture. That's how it had gotten sold to me. That's how the novella overtly sells itself, as judging the book by its cover: full of guns, and with an icon of a gun between the title and tagline and the author name. 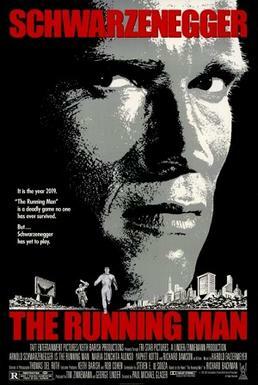 As I read it, my mind went to The Running Man (both the novel and the movie) more than anything else. Sure, there are plenty of guns and the insanity of a heavily armed society, but the theme of the entirety of America as a high-ammo Truman Show where at any moment, people might get caught up in gun violence made this a very surreal and uncomfortable experience to read. Joe: Not at all. Like Paul, my initial assumption was that this was going to skewer (in some capacity) America’s obsession and glorification of guns, gun culture, and violence. I missed Bennett’s comments, so I went into Vigilance with those initial assumptions firmly in place. Those assumptions were challenged fairly quickly when Bennett pushes the idea that this, all of this, is really about fear. The extended quote from Vigilance is awfully telling. Bennett pushes that farther and baldly states that America’s love of guns, America’s mythologizing of guns is directly tied to that fear which is then tied to the monopolizing and capitalizing of that fear. It’s also tied to the idea that a good man with a gun can save the day and that if the bad guys are armed, and you know they will be because by golly, they don’t respect laws, then we’ve all got to be armed, too. It’s irresponsible not to be. Of course, Vigilance is a novella about fear and complacency, which is also strangely tied together. brian: No, though, to be honest, all I needed to see were “Robert Jackson Bennett” and “dark science fiction” for me to jump into Vigilance. I went into it almost blind, just a fan of Bennett. I was not expecting Vigilance to be quite so near future, nor so close to a possible reality that I could smell it. It was hard for me to read Vigilance when I sit in an office all day that has a TV set on a cable news station that increasingly resembles ONT. It was hard for me to read when Vigilance’s “Ideal Person” is not only people I’ve met, but people I work with, and people I am related to. I was expecting something grim, but I was not expecting something real. Adri: And it’s interesting that, from a reader perspective, that fear is so transparently co-opted: something that is ostensibly directed at the elite, is then used by the elite, to put at risk everything but the elite, with just enough confusion over ownership to allow plausible deniability from both the media and the government. On the whole, it’s quite a concept to pack into novella length, although I suspect most of the target audience will be coming pre-invested to the line being taken here. Another thing I noticed about Vigilance was how well the characterisation fit with the wider themes of the novella. As you’d expect from the subject matter, there are no heroes here, and almost nobody who is genuinely sympathetic. Beyond that, though, there’s a constant sense of watching “personas” rather than real people. Indeed, the first character we are really introduced to is John McDean’s “Ideal Person”, supposedly the target audience for the Vigilance programme (which is hosted by fabricated CGI personas). From the power fantasies of the “actives” selected to carry out the shootings, to the highly scrutinised survivor role Delyna resists but is ultimately forced to play, to the more overt deceptions that come into play at the end, there’s a pervasive sense of unreality even outside the game world. What did you think of Bennett’s characters - did any leap out for any reason? Paul: McDean is ostensibly our main character, the one that we use for the majority of the novella in setting up the scenario. He’s hardly sympathetic, I think he is deliberately drawn to be that way. We can look at him as the Richard Dawson's Killian analogue. I am not sure that I hated McDean but I definitely wanted to see him taken down a peg by the end. Comeuppance on a personal level was one the expectations that I had for the story, and we do get that on an emotional level with him, when he sees what he has helped midwife come into fruition. I am not entirely happy with the blurb on the back, because the promise made there for him is only really paid off at the end, In a sense it gives away the ending. Adri: I felt that about the blurb too! It sets you up to be looking out for something to happen to McDean and his team from what feels like a too-early point, although the “how” of it did come as a surprise to me. But then, how the does the arc of the “secondary” PoV character, Delyna - a young black woman working in a bar where the Vigilance show is being screened - affected the sense of payoff for McDean’s comeuppance? Paul: That last scene with Delyna does underscore just how futile the addition of more and more weapons into a charged environment does anything except escalate matters. I do think it’s a “take that!” directed squarely at the “good guy with a gun” and the other narratives here in the US, which promote the idea that the only way to solve gun violence in schools and other places is to arm everyone. As Delyna sees and witnesses, all it does is up the body count. A society where everyone has weapons isn’t a safer and more stable society, it’s a more vulnerable and fragile one. Joe: I’d argue that Delyna is a sympathetic character and probably the closest to the reader’s “ideal” stand in character. She speaks up and speaks out when the easy and safe answer is to leave the television on. 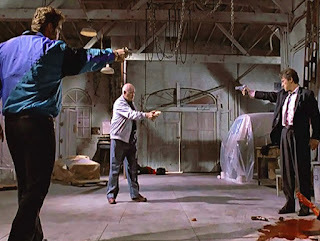 Of course, that’s followed by a Tarantino-esque standoff and then escalation after escalation. I think you’re on to something with your larger point that we’re watching personas act out their roles rather than following fully realized characters. I don’t know if you’ve read Bennett’s Divine Cities trilogy, but his skill at characterization is absolutely top notch. I think it’s a deliberate choice here. The game show nature of Vigilance lends itself to that unreality, as if we’re never sure if we’re ever out of the game world. Paul: Joe, I have read and loved the Divine Cities trilogy, and I think you are right here, Bennett is crafting these characters as roles to deliberate affect. It’s a bold stylistic choice, that goes with the whole unreality of the world. Adri: Agreed on Divine Cities too. brian: I’m definitely feeling the roles over characters, particularly since I can more clearly remember the function of each team member in the Vigilance production team over their names. Adri: As the token non-American in this group, I also have to ask about the elephant in the room: how US-specific is Vigilance? The idea of citizens living in fear of their own government clearly isn’t tied to a single nation or identity, and neither is the manipulation of crime or fear of the “other”. Yet, perhaps because artificiality is such a running theme through the novella, I found it hard to personally connect to the satirical elements of the text. Many of the points felt either very on-the-nose or too far-fetched, with little in that sweet spot where reality is distorted but all the more recognisable through the satirist’s lens. What were your experiences? Am I just too far away from Bennett’s “Ideal Person” in this case? brian: Terribly US-specific? Let’s go with terribly. Fear of government is so ingrained into American culture that we wrote the right to give ourselves the means to violently overthrow the government into our constitution. Every year, maybe every month, we suffer a violent outburst that involves someone using a firearm to shoot innocent people. Time after time, we decry the tragedy and refuse to do anything to address the cause, which is the wild proliferation of weapons in the US. Instead, we put bulletproof plates in childrens’ backpacks, drill on what to do during an “active shooter” incident, and wait for our turn at our own Vigilance. I can’t recognize Vigilance as satire. I see the conditions that lead to Vigilance happening too often for it to be anything but a glimpse into our future. Joe: I’d like to be able to say that the main aspect of Vigilance I found too far fetched was the mass shooting competition itself, but even though we joke about how The Running Man and The Hunger Games could never actually happen and would never be broadcast, I’m feeling a little cynical this morning. I’m not so sure. Besides, that mass shooting competition, the “vigilance” of the title, is the hook of the novel. There’s more than enough of a literary and film tradition to hang a story on. I’d really like to be able to say that Bennett’s commentary on America’s indifference to school shootings and murdered children is far fetched, but that’s just cooked into the fabric of American society right now. Hodges was not wrong. America’s legislative response was silence. Thoughts and prayers. Inaction. Indifference. Also, if you want to really depress yourself about America, spend some time reading through a list of school shootings in the United States. But, Adri, you said that you found the satire either too on the nose or too far fetched. Can you expand on that a bit more? For me, the stuff that was on the nose was generally just accurate and perhaps a bit sad / painful in the “it’s painful because it’s true” paraphrase of The Simpsons. Adri: I might be setting the bar too high, but I think that fully communicating satire across cultures is a challenge for both reader and writer, because it’s inevitably going to be the more subtle elements that are lost. And when a high action story like Vigilance stops communicating its subtlety, it just becomes a relentless gore-fest; incidentally, this is also how I feel about Tarantino films, and there’s definitely similarities here, and also I know lots of mostly-male English friends who who love Tarantino for what are almost certainly very similar reasons to their American counterparts, so this is not some impenetrable cultural barrier in general - perhaps just an aesthetic one. Paul: Is Vigilance satire or prediction? I think it’s just implausible enough to be firmly satire, but I am very uncomfortable, and was very uncomfortable as I read it, as to just how plausible a US that was sinking lower and lower by the day would turn to fear cannibalizing on itself, and America being okay with it. Fear may be the mindkiller, as Dune taught us, but Fear sells. Fear motivates people to do very terrible things in an effort to placate and ameliorate that fear. 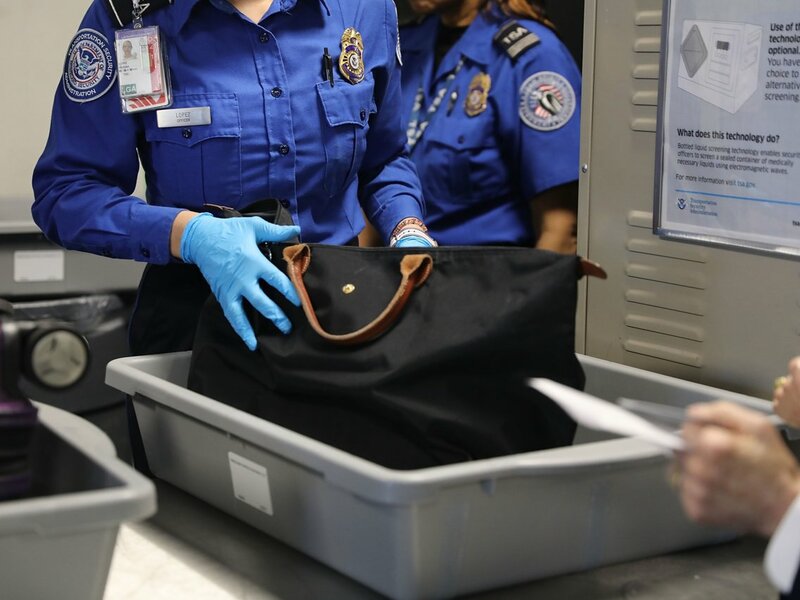 I think of Security Theater at airports--restrictions on liquids, and shoes just as simple examples of “being seen to address the fears” is meant for public relation, and oh at the same time reminding people of the danger.. Or the fears stoked up this fall and winter over the migrant caravan. But can we get from here, now to the world of Vigilance two decades hence? I don’t think we can logically and rationally get there from here, but I think we could get disturbingly closer. So Vigilance is still Satire, and not Cautionary Tale. But it’s a close run thing. Adri, you brought up before the idea of this being a US-specific book. Is there anywhere else in the world that you think a story like this could have been written? Brian, Joe and I swim in this water, and unless one widely travels, it’s hard to escape seeing that water as being anything except “the way things are”. Adri: My experiences are far from universal, but I don’t think you could write about this particular response to fear -- the state sanctioned libertarian arms race -- in any of the places I’ve lived. It’s interesting that Joe mentions Sandy Hook as a potential turning point above; because I grew up partly in Australia with British parents, I have the massacres in both Dunblane and Port Arthur (which happened within 2 months of each other in Scotland and Tasmania respectively; Dunblane in particular had heartbreaking similarities with Sandy Hook, over a decade later) in my childhood consciousness. Each prompted fundamental changes in gun control and the perception of guns in those countries, which were treated as completely self-evident. Over twenty years later, it means I now live in a city where outrage and grief is directed towards the level of knife crime, which is also awful, but doesn’t create the same level of destruction and collateral damage as guns do. It’s hard to get past my own ingrained bias that safety means fewer machines designed to kill you in close proximity, and that being “vigilant” and “safe” always means de-escalation except where absolutely necessary. And while I’ve also worked in conflict resolution, meaning I’ve met plenty of people for whom that bias isn’t true, that was a very different context to the relationship most Americans - particularly the ones most likely to be vocal about gun ownership - have with their national government. 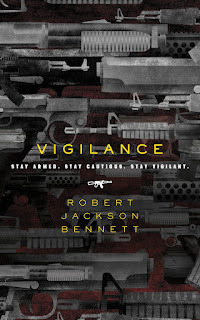 To me, this loops back to the point about what Vigilance is about: it’s not just a story poking fun at gun-obsession through a lens of ultraviolent absurdity, but one about the fear that brought this society about, and that it feeds back into in turn. While some elements of US national fear and the rhetoric around it do get replicated elsewhere - like the language around the war on terror, or immigration - the context around the Second Amendment, the NRA, the inaction and victim blaming and everything around it is so specific that you could only tell this story in the US. And, while many of us outside that context have news consumption and Twitter feeds that constantly bring us into contact with this debate, I do feel there’s a fundamental gap in what can be understood from an outsider perspective. To me, the ultraviolence and the fear of oppression feel equally speculative, even though I intellectually know they aren’t supposed to be. It means on an emotional level, Vigilance functions much more along the lines of The Hunger Games, a series which also marries both violence and fear to great effect but whose worldbuilding “how did we get there from here” gaps are tricky to intuit, than as the satirical "close to home" text it’s intended as. Speaking of international influences, I wanted to discuss the very left-field ending to the plot. In a nutshell, the thrust of the story is that McDean's crack team (who have enough power to be targets) spends so long thinking about internal threats that they forgot about external security, and in particular how threatening China is. This is a mistake that proves fatal not just to ONT and company but, apparently, to the entire audience of Vigilance. Again, this is a combination of "frighteningly plausible" - America is taken down by a combination of cyber security leaks and sexual exploitation of interns - and "not going to happen" - China would benefit from the US declining in power relative to itself, but probably not from instigating mass death. Paul : Was the out-of-left-field meant to be a deliberate writing technique on Bennett’s part to show that people were focusing on the wrong things, so that when “Tabitha” makes her reveal, it is a “Wait, what?” moment for reader and audience alike. The whole bit about Americans not paying attention to the fact that there was an international crisis going on for days--sadly, that’s not really very much satire any more, not here in the US, and the obsessions and blinders of the news media, now. brian: What I found interesting about the twist was the difference between McDean/ONT and the Chinese. ONT is using high technology to craft their fakes, and the Chinese used actual people. Infiltrating an organization using people isn’t high tech; it’s the oldest, most basic technique available. It still works, and it’s why we’re talking about what impact Marina Butina may have had on the US government by infiltrating a powerful gun advocacy lobby. But what McDean and ONT do to the American population, the Chinese did to McDean/ONT. They know their “Ideal Person” (McDean) and use his personal taste to manipulate him into doing what they want. He becomes so hyperfocused on sexual release with Tabitha that he installs some unknown phone app that ends up giving the Chinese a backdoor. He’s also so enamored with Bonnan (the Vigilance contestant who is also a literal Nazi) that he has to put him in the next episode. ONT is so focused on the shootings and violence that they don’t even consider that you don’t need a weapon or a threat to manipulate people. You can use something alluring and they will do what you want anyway. Adri: Any final thoughts before we wrap up this review? Joe: The comparison is to classic novels like The Running Man, Battle Royale, and The Hunger Games and I think the thing I am most curious about is whether Vigilance will have that sort of staying power or cultural impact. That level of impact is doubtful, but Vigilance does hit those buttons in very accessible terms. 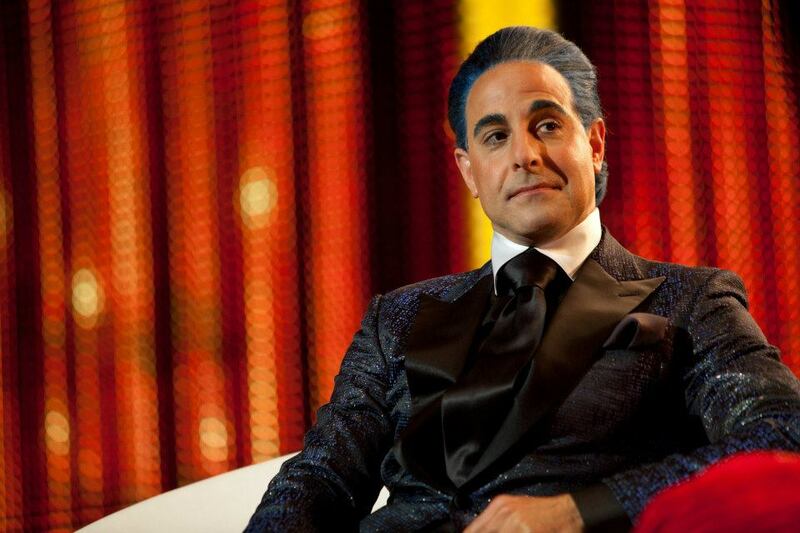 It may well surprise us. At the very least, it’s led to a great conversation here and hopefully similar conversations in other spaces. One thing that I wanted to note, that didn't come up earlier in the conversation is that as much as a primary focus of Vigilance is on the intersection of American gun and fear culture and how that it is monetized and weaponized, Bennett does make a point to very briefly bring race into the conversation. Race comes up in McDean's Ideal Person and it comes up sideways in aspects of how that fear culture is consumed, but it is dealt with firmly with the character of Delyna and in her family background. Delyna is black. I'm not sure how this plays outside the United States, but Black Lives Matter is a major movement inside America and police shootings are woven into the racial fabric of America. In the novella Delyna's father was a police officer killed in the line of duty, but he was killed by a fellow police officer, a white police officer who, instead of seeing another cop, saw a black man with a gun and opened fire. I don't have a larger point in bringing this up, except that I didn't want it to go unmentioned, and it could easily be the spark of another larger conversation. Hell, it could easily have been the spark for an alternate universe version of Vigilance. Thank you for putting this together, Adri. Paul: Thank you for putting this together, Adri. I agree with Joe, will this have the long term cultural impact of previous efforts in the genre? Will it be seen as an artifact of our times, or a dark prophecy of what could happen “if this goes on...”. Hard to tell. Bennett’s writing is certainly strong and sharpened toward a goal and social goal. In that, it has a hell of a lot of ambition--more so than The Running Man. It may not completely succeed at entertainment, but I don’t think Bennett wrote the book with that aim. I will be interested in how others view this, both within the SFF genresphere and as a more general conversation. Adri: You're welcome - thanks for participating, all, and thanks to everyone reading! Adri’s Verdict: 6.5, rounded up to 7. I understand what it's trying to accomplish but the particular blend of ultraviolence and satire didn't quite strike me right. brian’s Verdict: 7. It works for me because it’s a future I can grasp that I do not want. Observations about roles/stereotypes over characters are completely valid though. They’re not quite cardboard cutouts, but not far from it either. Joe’s Verdict: I’m between a 7 and an 8. Vigilance almost completely worked for me. 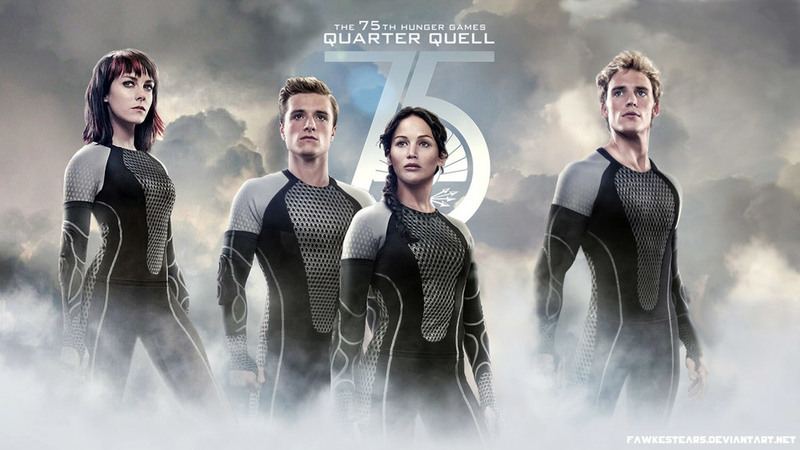 I get that most of the characters are more outline than breathing, but that’s part of why the story works so well. It’s about the ideas Bennett is playing with. Occasionally didactic, but done so well that it is remarkably effective. Paul’s Verdict: I’m somewhere on a 7.5. It’s nearly succeeded for me at what it was trying to do, but there were some pulling tensions between having characters as archetypes and a story that don’t quite mesh with the dialectic that Bennett was aiming for all the time. For all that, when it was “on”, it was terrifyingly effective, dark and chilling. If that was Bennett’s intention, then at points he succeeded to very strong effect.